Sriya Prajapati lives in Kirtipur, Nayabazar with her mother, little sister and her brother in one of her relative’s house. 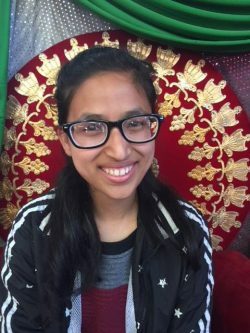 She was born on 1998 July 9.Currently she is a student of Jansewa school doing her Bachelor’s degree in BBS ( Bachelor in business studies, 1st year) with a goal to become a successful accountant in the future. Accounts, being her favorite subject, she would likely to develop her knowledge regarding the financial field. As she loves travelling, singing and writing, she tends to be a great enthusiastic girl doing different types of activities.